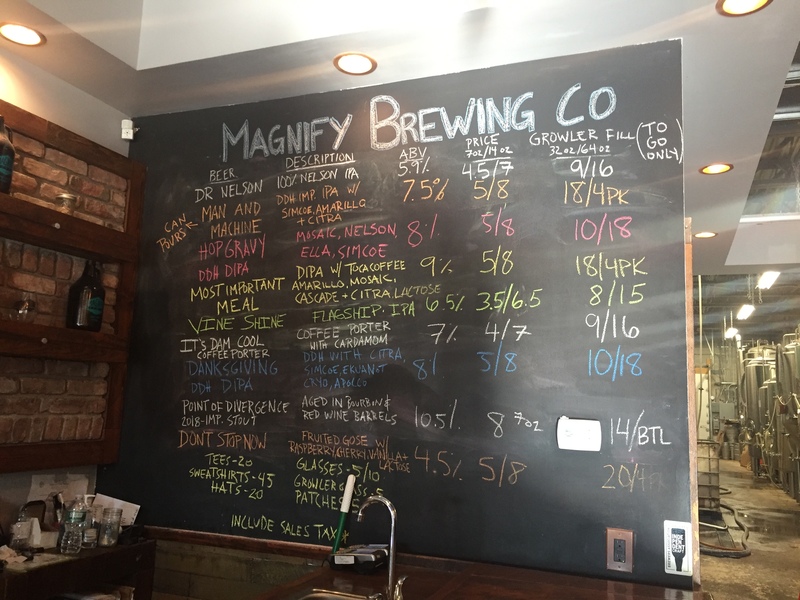 For almost two years I had been seeing beer friends (mainly on Instagram) post photos of product from Magnify Brewing Company, and my curiosity had been sufficiently piqued, as most people said great things about the beer offerings from this small brewery in the northern reaches of Essex County. And although their Fairfield, NJ location was only an hour or so away from me, it seemed that every time I fancied a ride down there either something came up or I couldn’t find a friend to go with me. But on the weekend after Thanksgiving, I made a commitment to get in the car and make the 56 minute drive to this gem of a brewery, and I would be more than pleased for having made the solo effort. Getting to Fairfield from the Lower Hudson Valley was easy, as it was virtually all interstate or state highway. But upon arrival at 1275 Bloomfield Avenue, I was thoroughly convinced that my iPhone had navigated me to the wrong place. Only after cautiously making my way past a variety of industrial buildings and seeing one with Magnify’s name and logo on it was my mind put at ease. Victory! Upon first stepping through the front door, the place strikes you as small yet roomy. The ceilings are high, and with the late-November sun shining through the front windows, the place took on an interesting glow. Now having arrived, the first task was to get situated and greet my server, whose name was Dale. “This is my first time visiting”, I said. 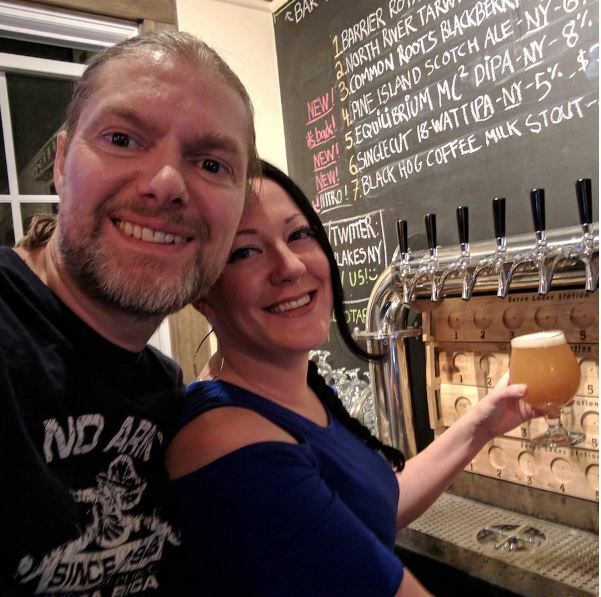 “What should I try first?” With no hesitation at all, Dale suggested the Most Important Meal, which is a double IPA infused with coffee from Toca Coffee Company of Pompton Plains. Besides the coffee, the complex flavor profile also includes oats and lactose sugar. Every swallow presented a somewhat different flavor experience, which was brilliant. I learned that this was available in cans, so this one would surely be in my takeout order. Before finishing the first beer, I took a few minutes to stage a good photo for my Instagram. 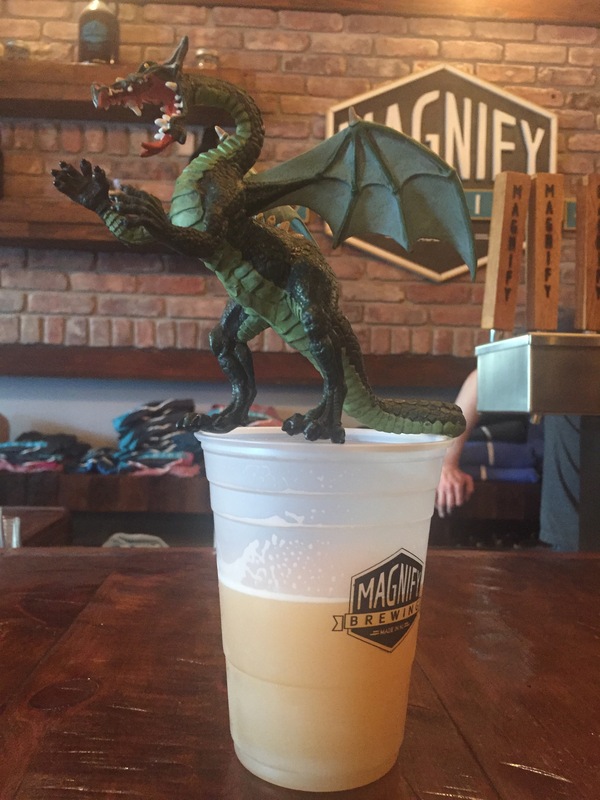 I usually photograph my beer with one of my many toy dragons and other mini-creatures. But this time, instead of bringing just one of them along, I brought them all. This made for a sort of “family photo”, if you will, on the main section of the bar. Oddly, no one seemed to think that this activity of mine was in the least bit weird. Anyway, my next choice on the menu was a DDH DIPA called Hop Gravy, which uses Mosaic, Nelson, Ella and Simcoe hops. With four different hops in the mix, it was clear to see why head brewer Erich Carrle calls this “gravy”, as with each sip, the hops just keep on coming ! I would have loved to take this one home too, but alas it was not available in cans, and I was hesitant to do a whole growler fill. Maybe next time. While I was working on the Hop Gravy, I wheeled around from the bar to see my friend Heather, who is better known in the Beerstagram world as @craftbarr. She was there with her boyfriend Ryan, and like me, it was their first visit to Magnify. I had just seen her two days prior at Seven Lakes Station in Sloatsburg, and had no idea I would see her again so soon. Cool ! Also, at one point during my visit, the brewery staff were doing a mash out, which filled the tasting room with the most delightful smell of malt that you could imagine. For a less inspired beer drinker, I’m sure the aroma could have been perceived as sensory overload. But to my olfactories, this was a slice of heaven. My last beer for the afternoon was a coffee porter called It’s Dam Cool, which was infused with cardamom, an herb that is commonly used in bloody marys, and which carries a wide variety of health benefits. It made me wonder “Can you drink yourself healthy with It’s Dam Cool?” Maybe one day I’ll find out. Before calling it a day, I gathered my takeout product, which included two 4-packs of the Most Important Meal, and 1/2 liter bottle of Point of Divergence, a sensational bourbon and red wine-barrel aged imperial stout. After saying my goodbyes to Heather and Ryan, and my friendly bar staff (who I shared ‘Grateful Dead’ talk with for much of the afternoon), I made my way home with my stash. I enjoyed myself thoroughly, and look forward to my next visit, hopefully with friends. Just about all of the beer excursions I make outside of my local area are pre-planned, but when I got word on Saturday, June 23rd that I had to make a trip to Middletown, CT, I took it as an opportunity to make an impromptu visit to 2 or 3 breweries in the area. Doing some quick research on Saturday night, I discovered that both breweries in Middletown would be closed on Sunday. Crap! 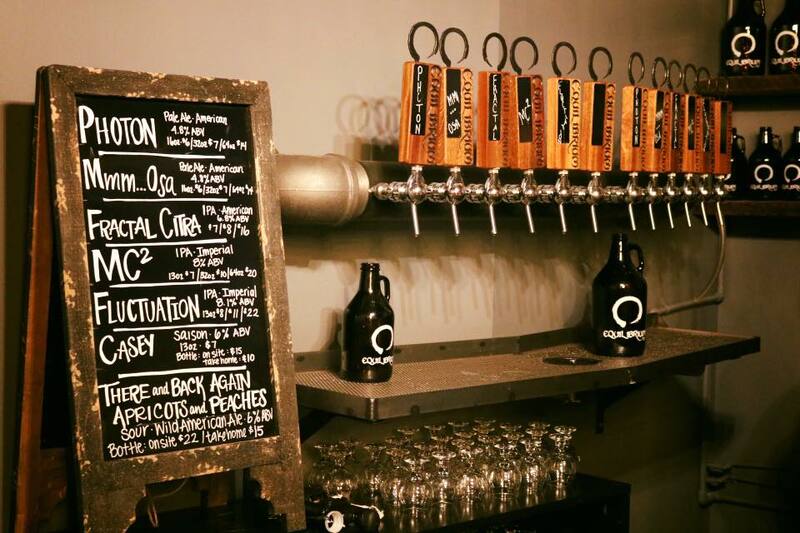 So I looked up Relic Brewing in Plainville, which I had previously pegged as one I’d like to visit. Also closed on Sundays. WTF?? This I simply didn’t understand. 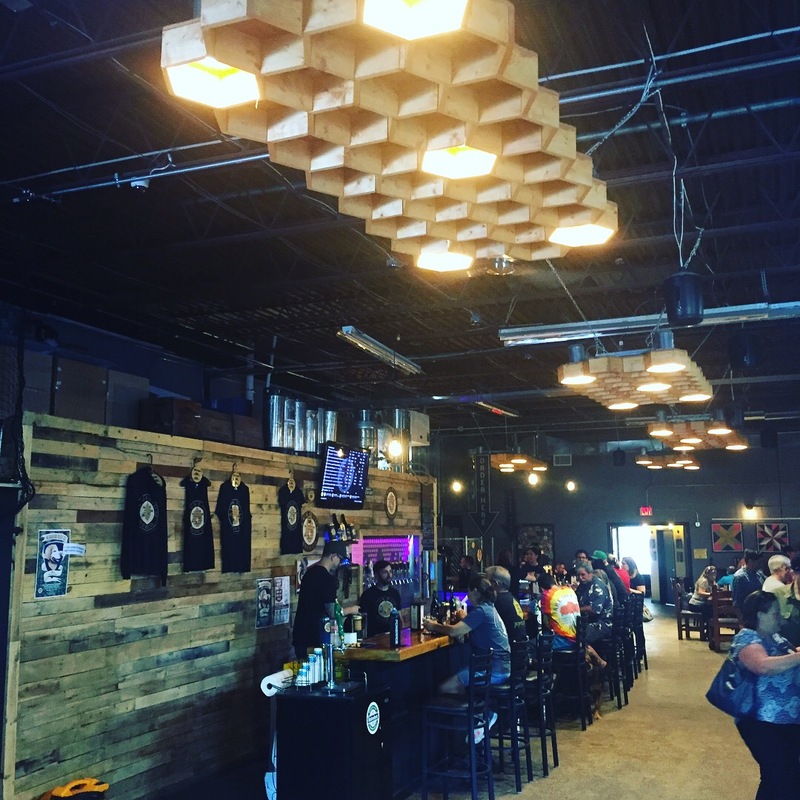 Every brewery in Orange County, NY has tap room hours on Sundays. But then I remembered that Connecticut, especially this part of the state, isn’t like metropolitan New York, so perhaps my expectations were a little high. Anyway, I reached out to my Instagram friend @jessbeerme for help, as I knew she lived in the Connecticut River region, and would be able to guide me regarding where to go. But before hearing back from her, I put my schedule together. 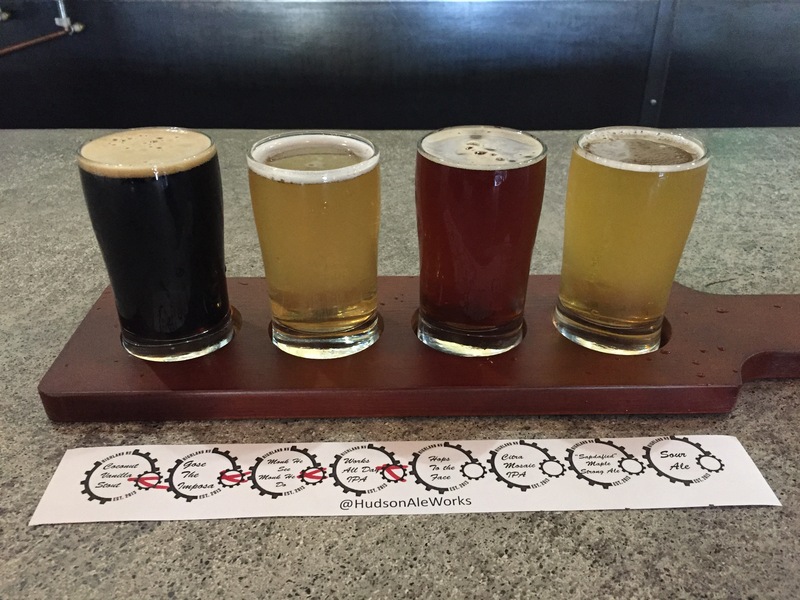 After taking care of my errand, I would plan to visit New Park Brewing, and then Hog River Brewing Company, both in West Hartford and close to Interstate 84, which would be my escape route home after the beer drinking was done. But as I was traveling along the interstate in the morning, a message came in from Jess. She affirmed my choices of New Park and Hog River, and also suggested that if I was hungry while in Middletown, Eli Cannons would be a great choice – good food and a great tap list, she said. After dropping off my “human cargo” at a Wendy’s in Middletown (and no, I was not smuggling children), I went across the street to the local package store to stock up on some local beers. And then, following Jess’s recommendation, I headed for Eli Cannons, which was a mere 2 miles away. The decor inside the restaurant was all about beer, and it made me feel right at home. I ordered myself a Stone Idoltrous IPA and a buffalo chicken wrap to eat. 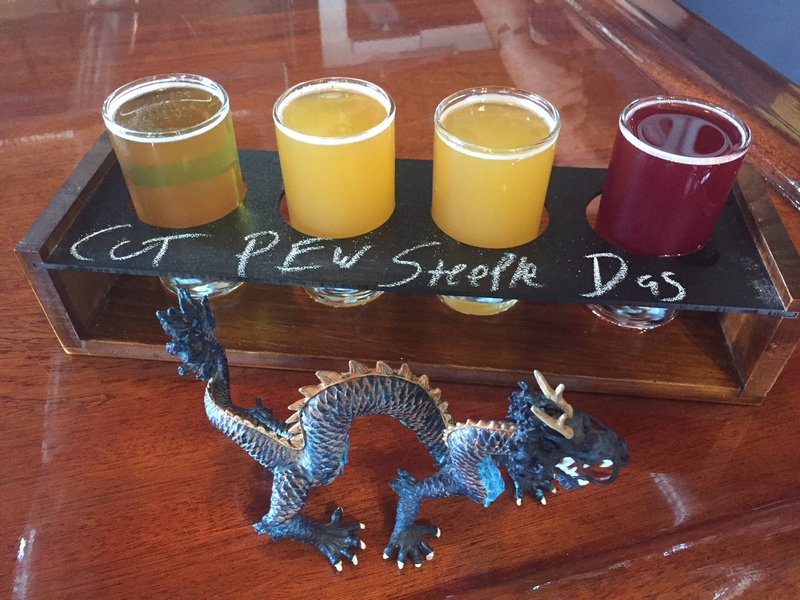 As I enjoyed both offerings, I got chatty with a young couple sitting next to me, and as you might surmise, the talk was all about Connecticut beer. 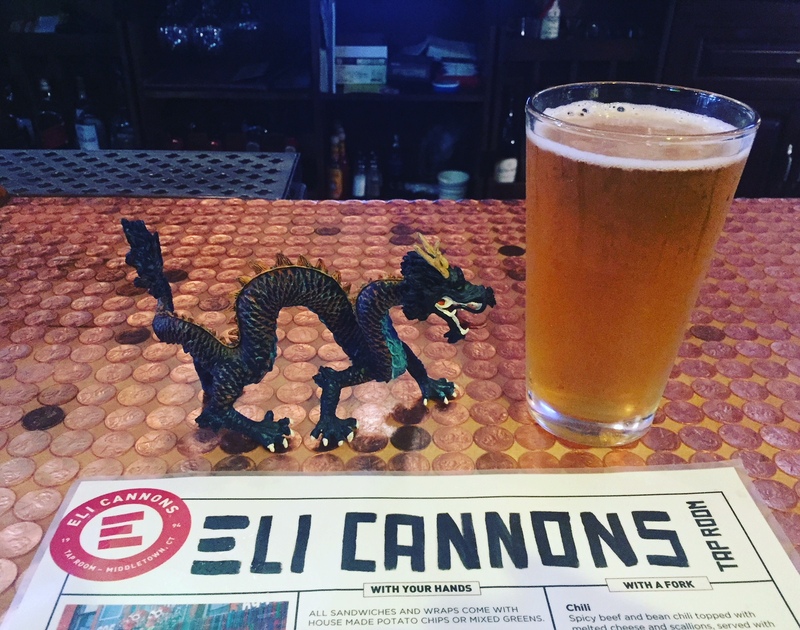 One of the items on Eli Cannons’s tap list was from a local establishment called Five Churches Brewing, and it came up in the conversation. Before I knew it, my next stop had changed from New Park to Five Churches, which was in nearby New Britain. So after saying my goodbyes to my new friends at Eli Cannons, I made the 20 minute drive to New Britain and Five Churches. Located in a somewhat nondescript brick building on Arch Street, this brewery was much more impressive on the inside than it was on the outside. A bit industrial in feel, with high ceilings and lots of brick, the inside space was very inviting. My trusty mascot Samson and I found a great spot at the bar, and I proceeded to order a flight, with a bit of variety. The four beers I chose were their Kinetic-Cut Kolsch, Pew Pew American IPA, Steeple People Imperial IPA (in a tribute to churches, I suppose), and Das Froot, a blackberry-flavored Berliner Weisse. Just as had happened at Eli Cannons, I found myself situated next to a nice young couple, and engaged in plenty of solid beer talk. And as a consequence of that chat, there was yet another change in plans. In lieu of going to Hog River from here, I was instead on my way to Alvarium Brewing Company, which was just a couple of miles away on the other side of New Britain. The Alvarium space was very different than Five Churches. Located in an industrial park building, you need to walk all the way around the building from the parking lot to get to the front door, and you wonder “Am I going to a brewery or a ball bearing factory?” But the moment you walk in the the door, you’re hit in the nose with the smell of malt, and there’s no doubt you’ve found the home of a bona fide brewing operation. My new friends Frank and Shelby, who I met at Five Churches, would be following a few minutes behind me to Alvarium, but in the meantime I set myself up with a nice flight, including White Denim Wit, Don’t Sue Me, Bro! Saison, Party Boy IIPA, Clusternutter Peanut Butter Porter, and The Death of Novelty Sour. As I cased the room at Alvarium, it was clear that virtually everything in the place carried a bee theme. Curious as to why, I Googled the name, and to no surprise, I learned that ‘alvarium’ is a Latin-based word that means beehive. So there you have it. Before departing Alvarium, I picked up some takeout – a crowler of Phresh, their NEIPA offering, and a bottle of Overlord, a bourbon barrel aged English style barley wine. Rainstorms and summer Sunday traffic plagued the drive back to New York, adding at least 30 minutes to the expected effort. But these external circumstances could do nothing to detract from the splendid experiences of the day. And Jess, next time I’m in Connecticut I will give you more notice so you can plan to join. Until then, keep the faith everyone! It’s fair to say that the opening of a new Hudson Valley brewery is – at least for me – one of the most exciting events there is. And with a full 50+ breweries in the region now doing their thing, you’d think there wouldn’t be room for more. 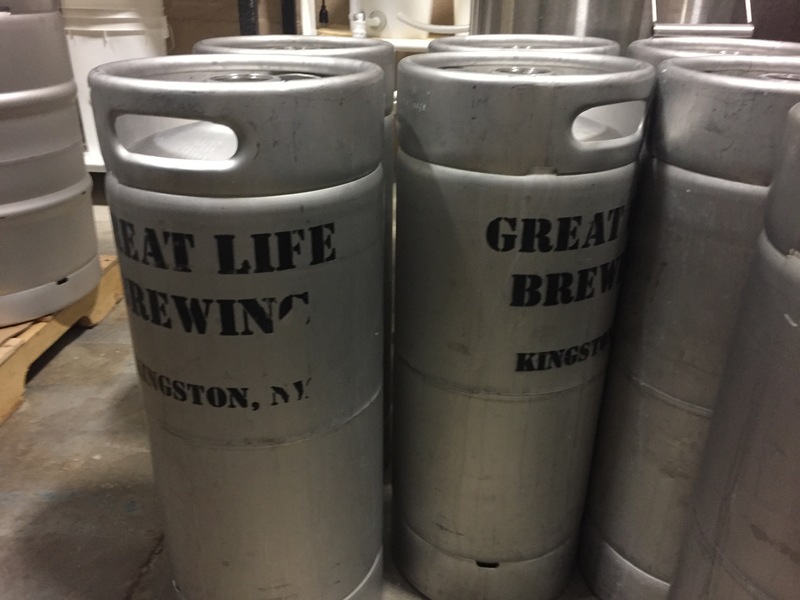 But each new opening proves that notion wrong, and the latest business to bring home to us the idea that “more is better” is Kingston, NY’s Great Life Brewing. the Fall of 2015. But since that time they have been without a taproom to showcase their offerings. That is, until now. The taproom had a soft opening two weeks ago, for which I was sent a private invite by assistant brewer and taproom manager Cody Lynch. But I couldn’t make it due to a family obligation, so I was not about to miss their formal opening, which brought well over 100 thirsty craft beer aficionados to their warehouse location on this chilly pre-Winter evening. 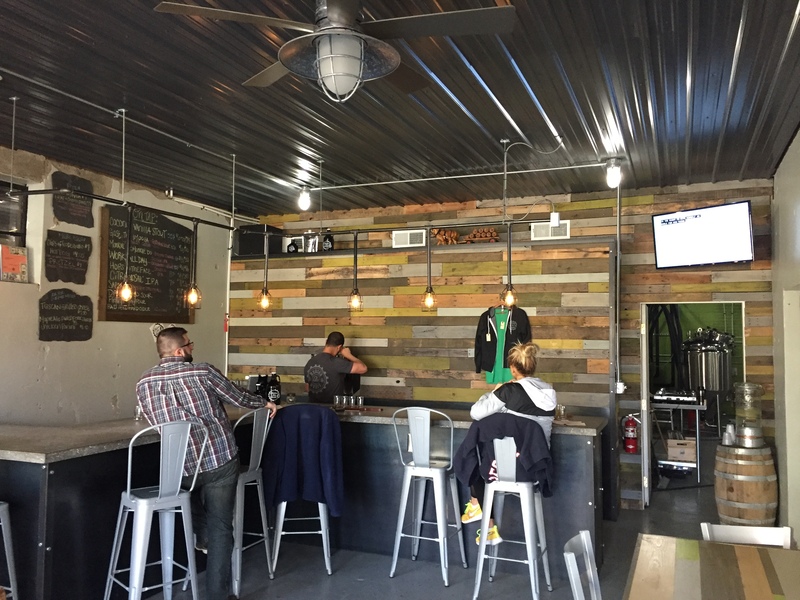 The taproom essentially shares its space with the brew house, and the interior of the building is fairly raw, with walls seemingly unpainted since Clancy took possession of the property 3 years ago. 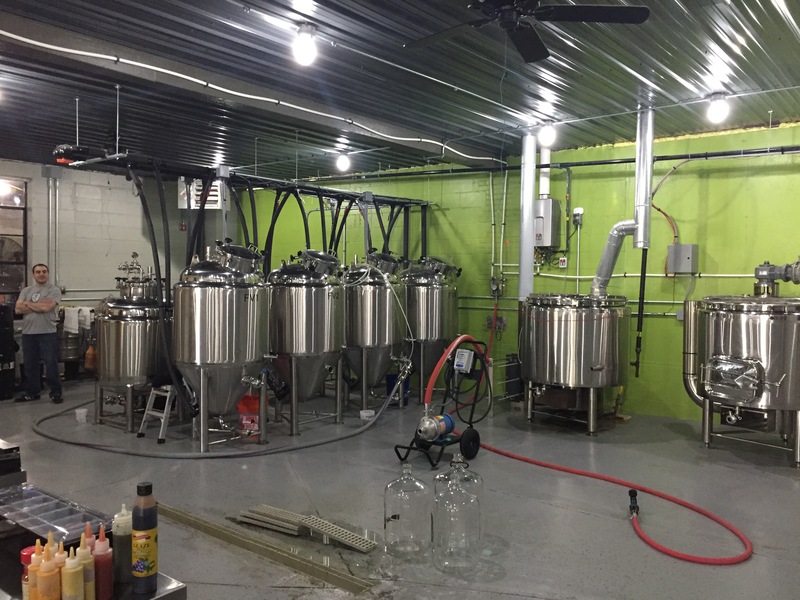 Besides the primary brewing vessels (which are 7 bbls in size), there is equipment scattered around – I spied a grain crusher and a chiller among them. There are even hoses hanging from hooks on the walls. But patrons didn’t seem to mind any of that in the least as they chatted and enthusiastically drank their beers. 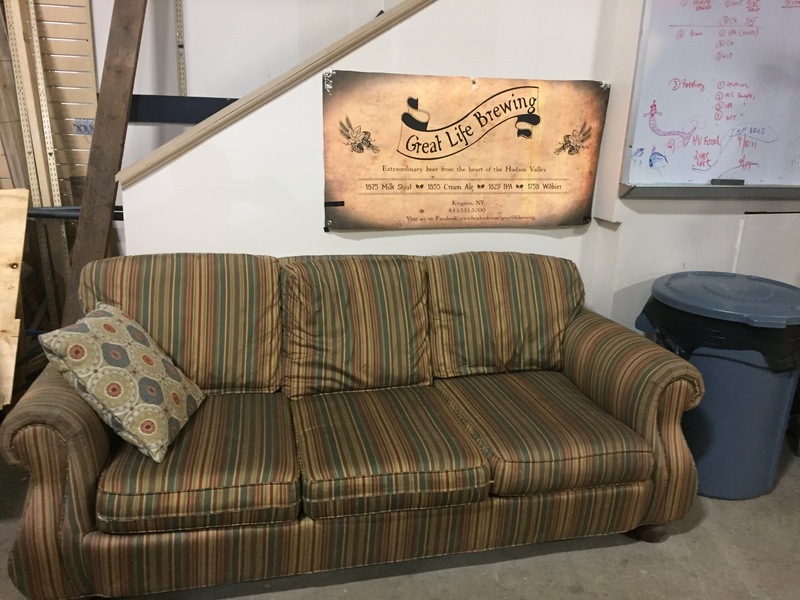 It’s a relaxed atmosphere, for sure, and so much so that it even features a couch for you to plop yourself down in if you’re so inclined. Each style’s name includes a historic date that denotes a significant event in the history of brewing. Rather than spell them all out here, I encourage you to visit the brewery and ask your publican to expound directly on the basis for each name. In addition to their own brews, there are also a couple of guest taps, which tonight included Rushing Duck‘s fabulous Brux IPA, and Applewood Orchard & Winery‘s well-regarded Naked Flock draft cider. And for those who don’t like beer or cider, there are red and white wines from Warwick’s Clearview Estates Winery. During my visit, I had the pleasure to be seated next to a young craft beer fan named Lauren who, like myself, was a personal friend of Cody, and was there to show her support. Lauren and I talked breweries, Instagram, and the virtues of Hudson Valley living. In the end, we determined that we would no doubt share a beer again sometime in the near future. I began my evening with a glass of the Witbier, then moved on to the Milk Stout, and ended the night with the Cream Ale. Not wanting to leave any stone unturned, I took home a growler of the IPA, which, for those who know this writer are well aware, will not last long in my refrigerator. Please join me in welcoming this terrific new brewery to the Hudson Valley family, and pay them a visit when you get a chance. It’s most common that when I pay a visit to a new brewery, they’ve got a lively tap room with plenty of interesting offerings to tantalize my palate with. And thus it was quite unusual when I got into my car to make the two-hour drive up to Margaretville, NY, future site of the Faith American Brewing Company. Yes, that’s right, this is a future site, which is where the unusual aspect of my visit comes in. 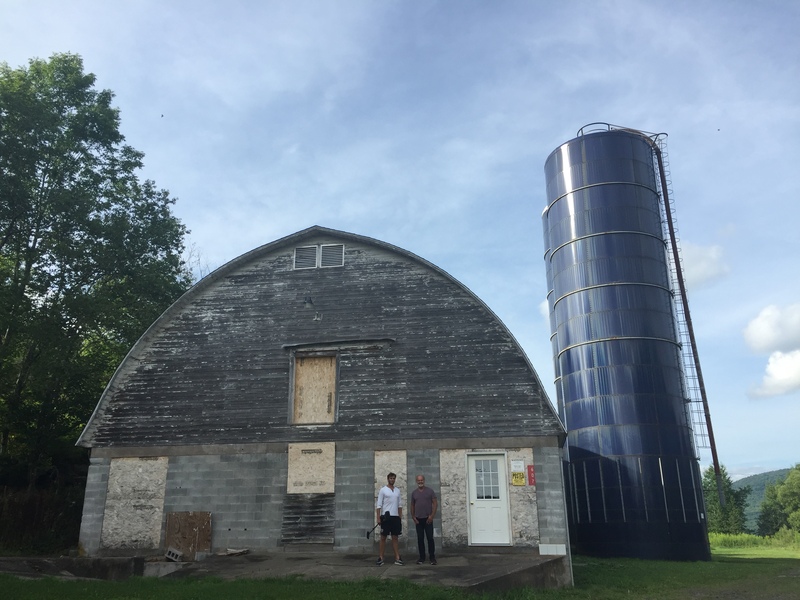 My brewery tour was actually more of a property tour, which featured a first hand look at the large dairy barn – long since abandoned from use – that will one day house the brewery operations, as well as a tap room and restaurant. Arriving at the farm location on a back road a few miles north of Margaretville, I was scratching my head as to which of their driveways to use and where to park my car. As with any such property, there were several buildings, each serving a different purpose. After stumbling toward what I quickly realized was a caretaker’s building, I did an about face and started walking toward a swimming pool, where an adult and several children were splashing playfully. As I neared it and said “hi”, I was greeted by the property owner himself, who graciously directed me to the main house, where I could announce myself and be welcomed by the rest of the family. For some of you who know this writer, you’re aware that I’m a runner. Well, two of the ladies in the family here are runners as well, and I was invited to go on a short run with them before I began my formal meeting and tour. Despite the fact that I was without any semblance of running gear, I accepted the invitation and put in a couple of miles with the ladies in my street clothes and Chuck Taylor hightops. The scenery on this marvelous country road was nothing short of spectacular. Once we were back to the house and cooled off, I had a chance to sit down with Kelsey Grammer and Stuart Walsh, the two men who are the brain trust behind Faith American Brewing. As these kinds of meetings tend to go, we started off with a beer. 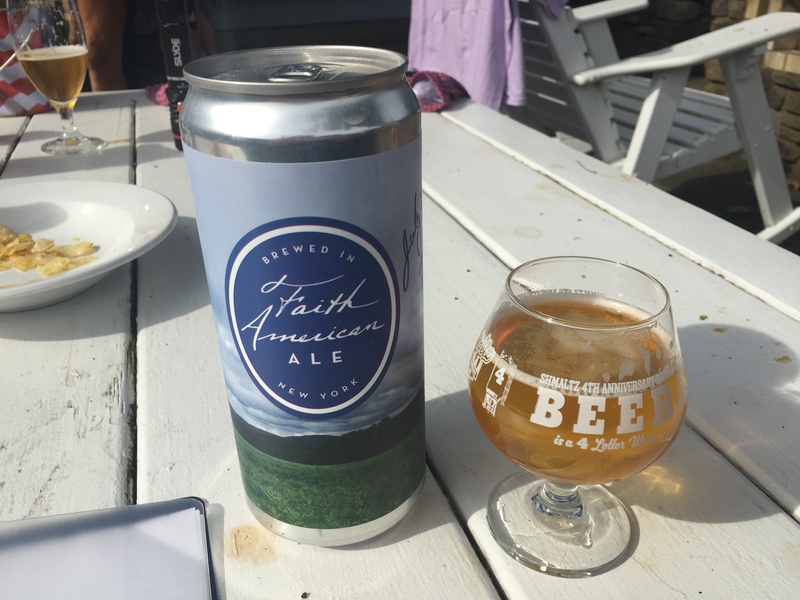 In this case, a private tasting of their flagship offering, Faith American Ale. Lightly hopped and coming in at 5% ABV, this beer has just the right amount of malt to make a statement, yet won’t deliver a “one and done” message to your taste buds. Stuart served it to me in an 8 oz glass that was branded with Shmalz Brewing Company logos. Which makes sense given that for at least the short-term future, Shmalz will be contract brewing the Faith American Ale recipe. Before I had a chance to get very far with my first pour, Kelsey waved me over to the all-terrain passenger vehicle that they use to traverse the property and said “let’s go take a ride”. He, Stuart and I piled in, as did three of their combined 5 children, which made for a more joyous journey. Note: I brought my beer with me, but had a difficult time drinking it due to the bumpiness of the ride. Lesson learned. The ride to the dairy barn – which was on the far side of this expansive property – was a delight. Past a small apple orchard, up and down hills, beneath trees and thru meadows we rode before finally arriving at Ruff Rd, the barn’s address, at least for now. Nearly 300 feet in length (as long as a football field), the barn is an imposing structure. With high, lofted ceilings and all the cement remains from where dozens and dozens of cows once stood and gave their milk, the place was a vision of yesteryear. And at this point, it is now a vision of the future in the eyes of the Faith American owners. Kelsey proudly described where the taproom and restaurant would be, where the mash tuns and fermenting vessels would one day stand, and where the shipping doors would be at the far end of the building. 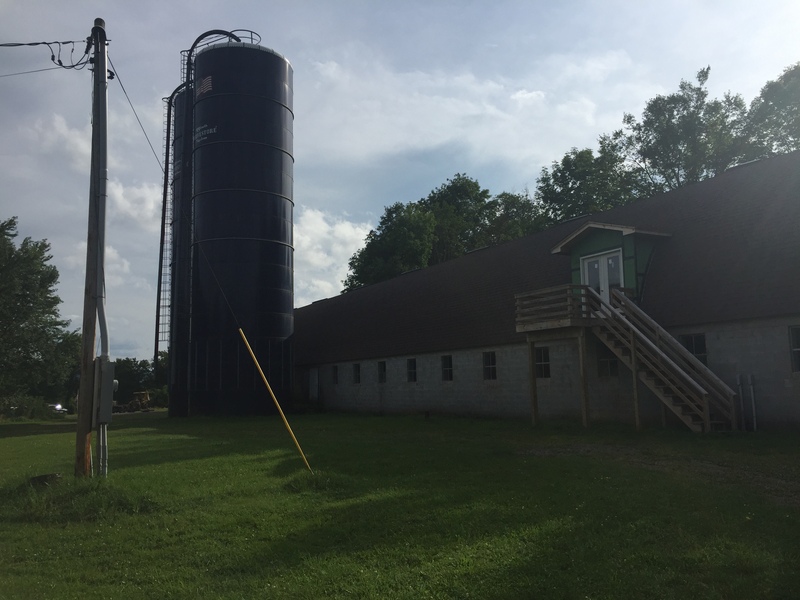 Alongside the barn are two tall grain silos, which Kelsey explained would be re-purposed in some way as part of either the building design, brewery operations, or perhaps both. The plan with respect to opening Faith American will be to break ground on the construction in 2018 (architectural designs on the barn are still ongoing) and to open brewery operations in 2019. And in the interim, Jeremy Cowan and the folks at Shmalz will continue to execute on the production of Faith American Ale. On our return trip to the main house, we rode a different route through a broad meadow that revealed perhaps the most sensational view on the whole property. In Fall, I have no doubt that the Delaware County colors make this farm a glorious place to frolic. Sitting back down on the patio, we resumed with our tasting of Faith American Ale, and my gracious hosts continued to fill my empty glass for several more hours as we ate pizza and talked about beer, running, Classic Rock, our respective good old days living in Manhattan, and much more. Stuart is a filmmaker, and using his laptop, he showed me trailers of two of his films – one a horror spoof about the local “Calico Indians” (not real Indians, BTW), and the other a sort of running rave up. Each one featured members of the Grammer and Walsh families as actors, and they both were, in a word, fun! As the sun set on the Catskills and the mosquitoes began making their presence known, I took my leave of this great group, but not before expressing my thanks and letting them all know that there will be more to follow, as part of our meeting was talk of creating a running event that will act as both a marketing tool for Faith American and a tourism boost for Margaretville. So long for now, Faith American Brewing Company, but definitely not goodbye. See you again soon! 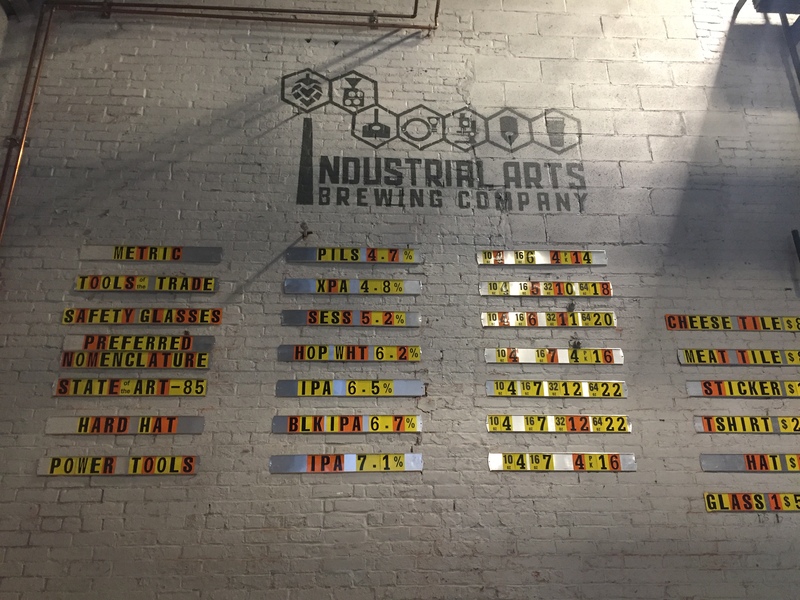 A true beer geek always knows how to capitalize on a business trip that takes them even remotely close to a great brewery, and such was the premise behind my first-ever visit to Industrial Arts Brewing Company in Rockland County. Thinking I knew the name of every town in the Hudson Valley’s 3rd most populous county, I had to actually look at the map to see where Garnerville was. Ah, between Thiells and West Haverstraw! Now I could get a fix on the place and figure out the shortest route there from Mahwah, where I had gone to attend to some post-race business from my Rock The Ridge event, which was held the previous weekend. Following Rte 202 virtually all the way there, I made a final right-hand turn onto W. Railroad Avenue and began looking for the brewery building’s distinctive tall brick smokestack. But even having IDed the building, finding the way into the place was a challenge. 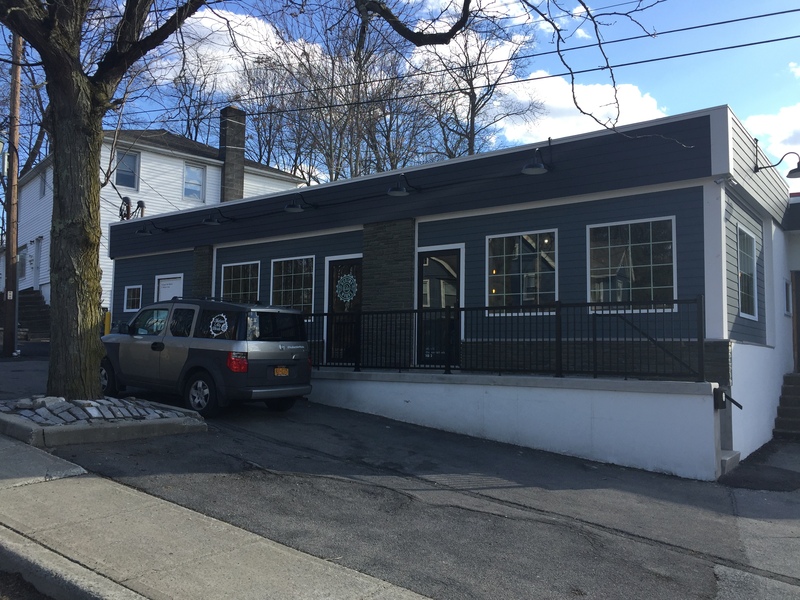 Although if you’ve been around to a lot of the breweries in the Hudson Valley, you’ve probably noticed that some of them are in very nondescript buildings, and have little signage out front to welcome you with. And such was the case with Industrial Arts. There is no sign or welcome mat at the front, and I almost made the mistake of walking through an open door and into the service side of the bar. But seeing the bartender’s back to me made me realize the error, and I eventually found the virtually unmarked front door, tagged only with a small sign on metal stripping that said “open”. The space inside is clean for an industrial building, and high-tech in look and feel. 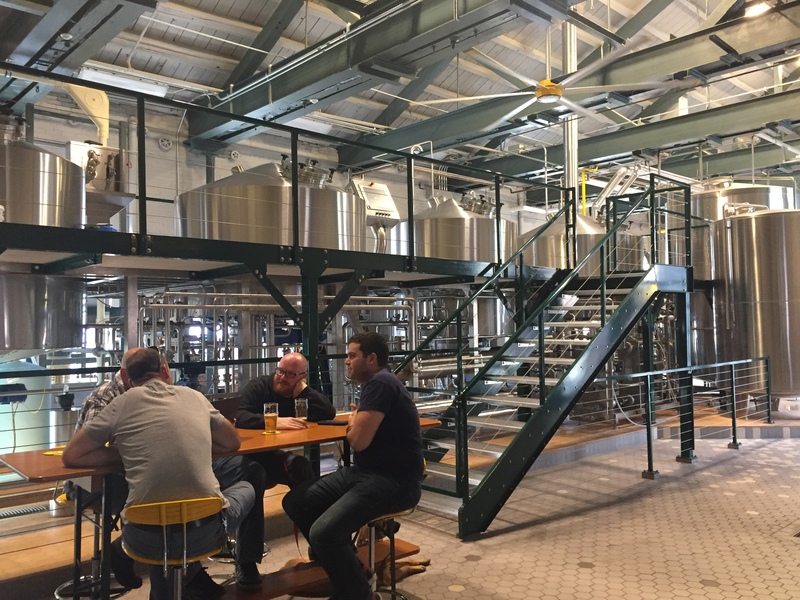 With high ceilings, the place is remarkably spacious to the eye, despite the fact that the brewery equipment – which is sufficiently cordoned off by a metal and wire “wall” – occupies at least half of the floor’s square footage. True to its name and brand, the place oozes the word ‘industrial’, from its exposed iron I-beams to the fitting names that brewer Jeff O’Neil has given to his marvelous malted concoctions. With beers called Hard Hat, Safety Glasses and Power Tools, I could hardly wait to belly up to the bar and start trying them! Intrigued by all seven options on the beer list (which was affixed to the brick wall of the brew house on a set of metal strips), I opted to try just two today and save the remainder of the menu for another visit. 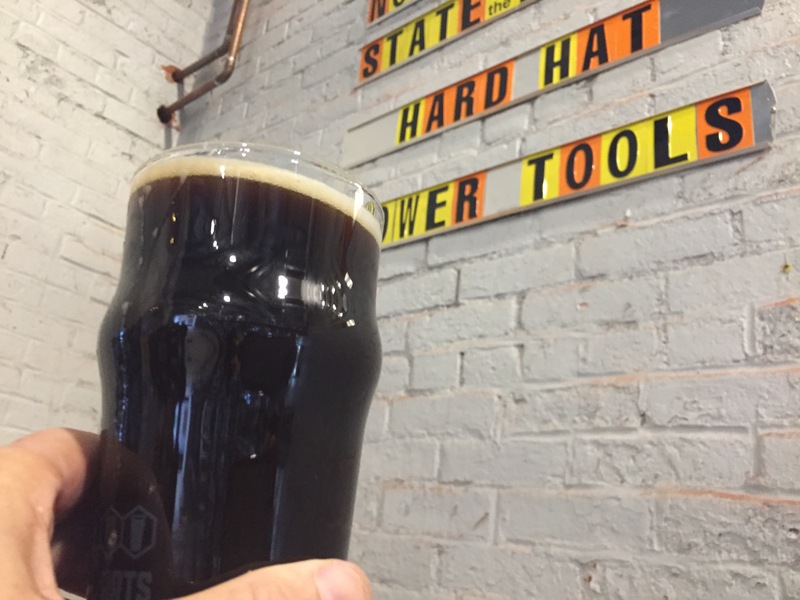 My first go was the Hard Hat, a black IPA that was appropriately colored and hopped for the style. Rich in flavor but without the maltiness of a porter, this was a great pour. And at 6.7% ABV, it leaves room for a 2nd one even if you have to do the driving home afterwards. 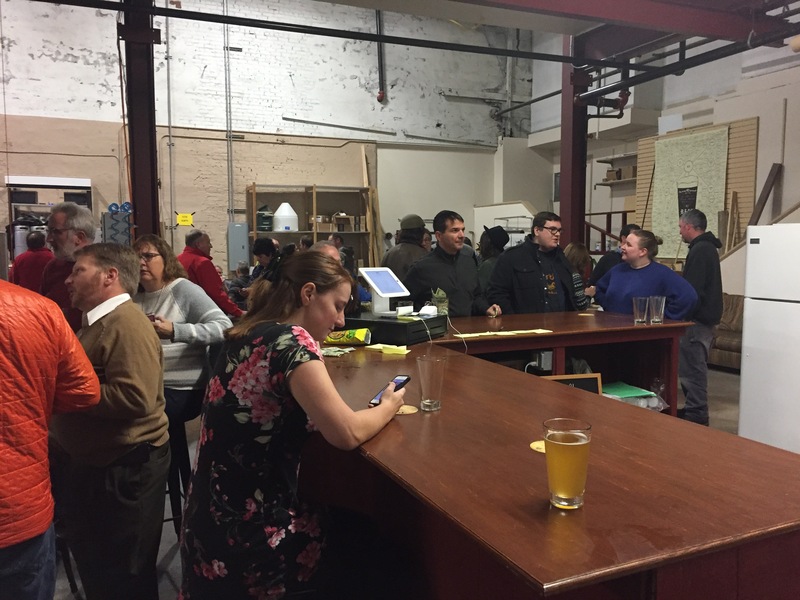 As I enjoyed my beer, I walked around the brewery floor, observing the other patrons and listening to some of the dialogue going on at the bar. After a bit of a wait, I noted that a seat at the bar was opening. In my extremely humble opinion, the most perfect way to get a feel for a beer establishment is to be as close to the taps as possible, so I went for the stool before someone could beat me to it. The bar area itself is fairly unique as breweries go. 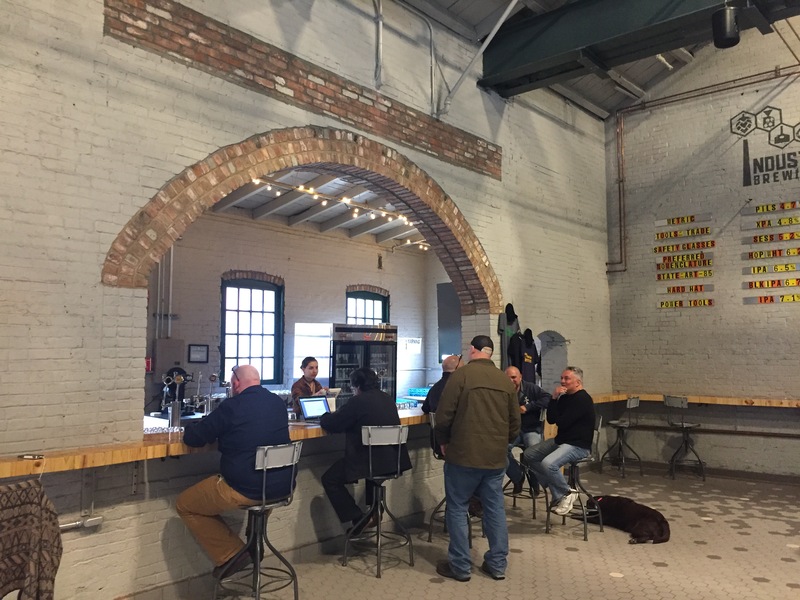 It presents as an archway in the white brickwork of the southwestern corner of the brew house, which gives the feel that you’re seeing through a portal of some sort, or perhaps ordering brick oven pizza rather than hand-crafted malt beverages. After finishing the Hard Hat, I contemplated which of the remaining choices would be my 2nd and final beer for the evening. In quick stead, I settled on the Tools of the Trade, which at 4.8% was easily the most sessionable choice on the menu, and what the brewery calls an XPA. Although there is no official GABF category for XPA, I’ve read that they tend to fall somewhere between an IPA and an American Pale in terms of style. And I would say that Tools of the Trade is a little closer to IPA than APA, as the hop bitterness was more notable than in any pale ale I have ever had. Perhaps hops is the “X” (i.e. extra) in this style. Given that I arrived late and only had time to have two of this great brewery’s offerings, I will have to come back again – perhaps next time with friends – to try the likes of Safety Glasses (session ale), Power Tools (IPA), Metric (pilsner) and others. When you’re in the area, plan to drop in on Industrial Arts. And tell them the Beer Snob sent you. If we closely examine our daily activities, we sometimes (or maybe often) find that a negative circumstance is the gateway to something positive. 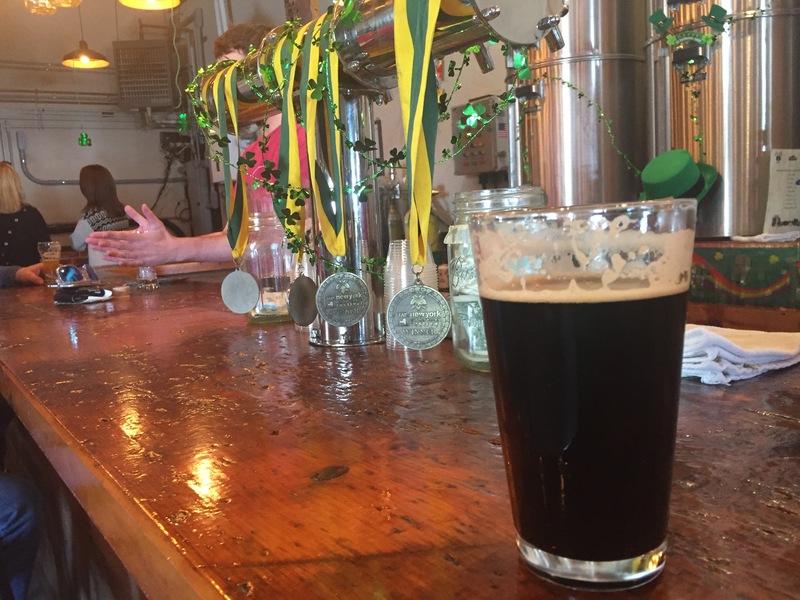 And such was the case on Sunday, April 2nd as I sought out a visit to a craft establishment in the New Paltz area after participating in a 14-mile group run in Mohonk Preserve. Sweaty, tired, and already feeling a bit sore after romping around for 3+ hours in “one of Earth’s last great places”, I needed a fresh glass of craft beer in the worst possible way. So as I pulled out of the Spring Farm trail head parking lot at about 2:00pm, I set my GPS for the address of Yard Owl Brewery in Gardiner. About 20 minutes away, my device told me. I could certainly be patient for that long. But patience turned to disappointment as I arrived at Yard Owl’s small, industrial location on a remote back street of Gardiner. It was 2:23pm, and the sign on the door i ndicated that they were open from 3:00pm – 7:00pm. Not wanting to wait around for nearly 40 minutes, I decided to do something active rather than passive, and I pursued ‘plan B’. It turned out to be a blessing in disguise. Fourteen miles and 25 minutes later, I found myself arriving at my destination, Hudson Ale Works in Highland, NY. 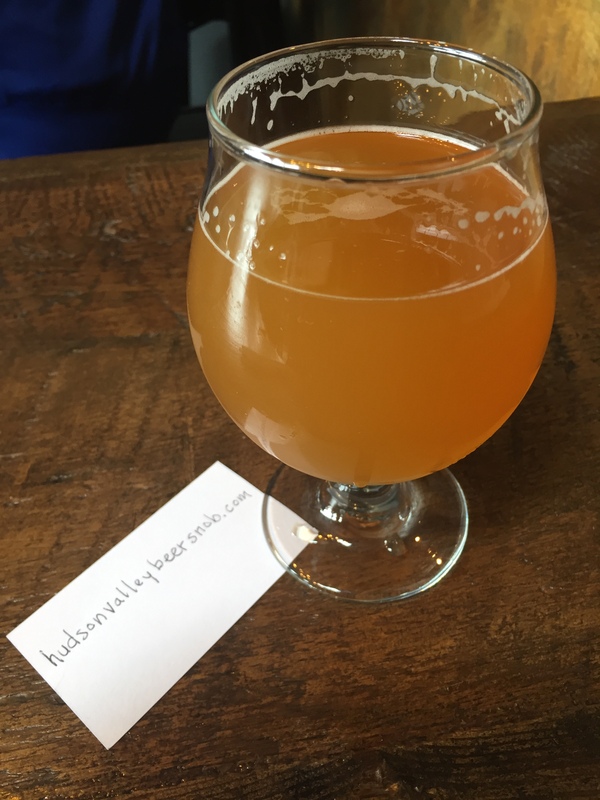 In all of my bull sessions with fellow Hudson Valley beer lovers, this brewery had never come up in conversation, so maybe I would be the one to experience it first, I thought to myself, and then report back to friends. In any case, unlike my previous stop, Hudson Ale Works was open for business, and I was glad to finally be close to that first heavenly taste of malt and hops. The building itself has a fairly crisp look from the outside, and to my delight, the inside was equal in presentation to the exterior, with caged lanterns hanging above a sleek stone-topped bar, and multicolored wood panels providing an eye pleasing backdrop. A great sour, whose name is possibly inspired by the historical Romanian figure Vlad the Impaler. This is a serious sour that leaves its mark. And at 4.2% ABV, on a warm summer day this one could keep your palate satisfied for hours on end. The Huell hops in this aptly named session IPA immediately impart a notable flavor that lasts on the tongue from start to finish. Coming in at 4.5%, this great beer has a full bitterness profile that is appropriate for the style. Perfect for the everyday IPA lover. (which is actually two rooms), they will be building a 600 square foot patio in the front that he said he hopes to have complete in time for summer. The interesting thing about Hudson Ale Works is the owner/labor structure. 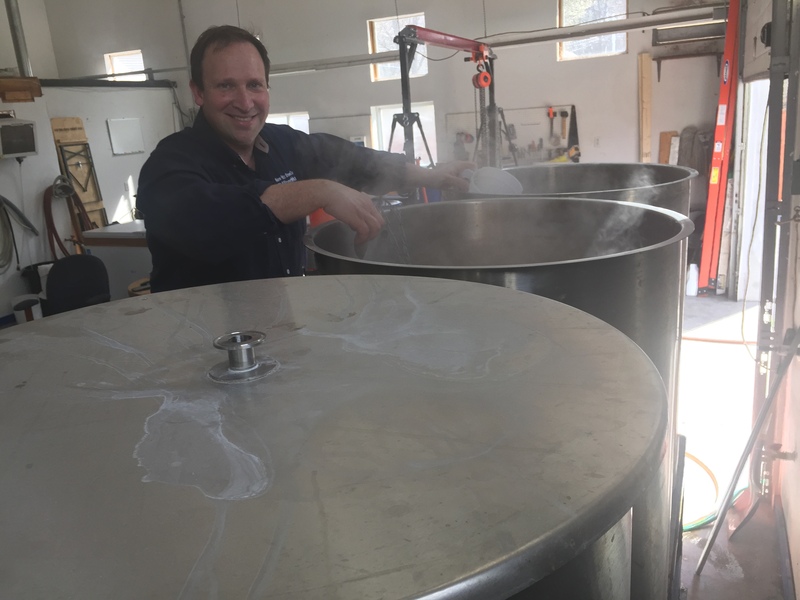 Along with Josh Zimmerman and Neil Trapani (presumably Adam’s brother, although I admittedly didn’t ask), Adam and his partners all identify themselves as both “owner” and “brewer” in addition to the many other hats that they must certainly wear. After declaring my identity (a beer snob should never hide behind his beer glass, after all), I was given a friendly peek at the brew house, where I was shown the small but active 3 bbl system they use to push out product not only to their tap room, but to their dozens of retail accounts, which are all delivered to by way of a two-tone grey Honda Element (seen in the picture above). I concluded my session (and visit) with a glass of the brewery’s Maple Strong Ale offering, which they call Supdafied. At 9% ABV and full of body and flavor, it didn’t disappoint, and is one that I hope will find its way into a can at some point so I can enjoy it at home as well. All in all, Hudson Ale Works is a great brewery, and I am very confident they will have a bright future here in the Hudson Valley. Pay them a visit when you get a chance. And for those who caught the Warren Zevon reference in the title of this post, bravo to you! 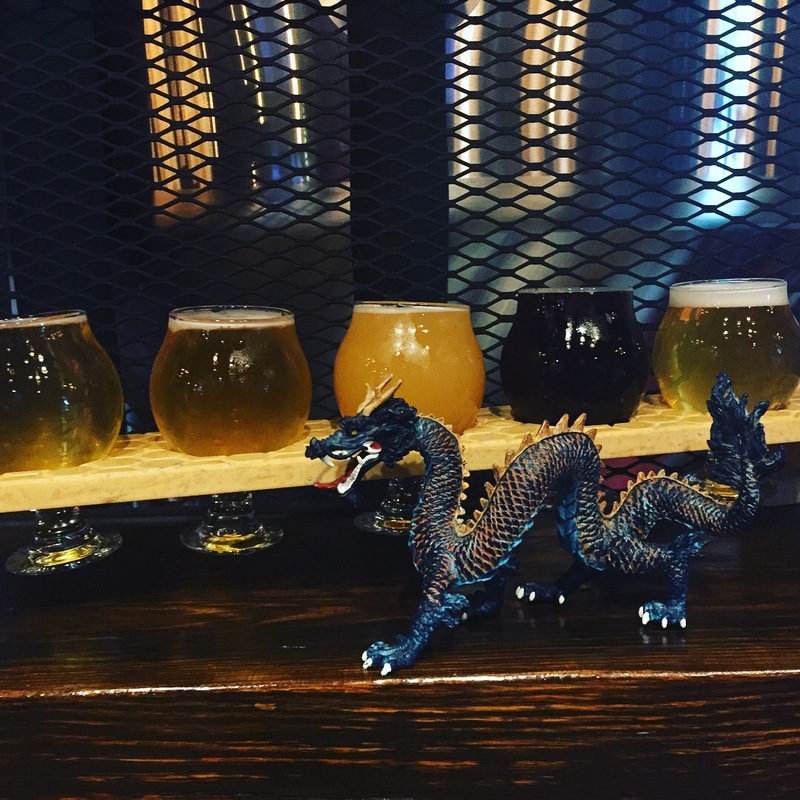 As vital as we know the various breweries and brewpubs are to the burgeoning Hudson Valley beer scene, the one immutable fact is – they can’t do it all by th emselves. These great brewers need other voices out there, other channels for showcasing the great products they’re putting in front of discerning craft beer drinkers across the region. Craft pubs are that secondary channel. And although these specialty business establishments have been around for longer than the local beer scene itself, they now have an all-new raison de etre; to be a main outlet for the numerous Hudson Valley brewers who are doing all of these fantastic things with malt and hops. Due to their specialty niche and the corresponding crowd that goes with it (let’s face it, most beer drinkers still favor “Big Beer”), craft pubs tend to be small, and tucked into out-of-the-way nooks and crannies of the business neighborhoods they inhabit. One such establishment opened a mere seven months ago in Sloatsburg, NY, but has very quickly solidified itself as perhaps the go-to craft pub in the lower Hudson Valley. and you’ll be regaled with a plethora of knowledge about beer brands and styles as never before. 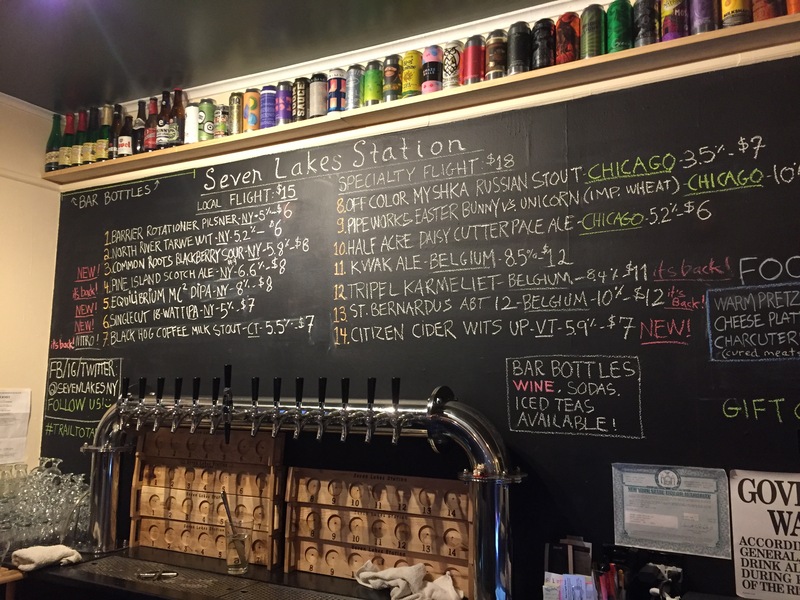 Although small, as many craft pubs are, the notion of Seven Lakes Station’s space being cramped or limited disappears into the bar-side conversation that seems to take place almost organically between owners, staff, and customers. Hang out there for just a short while, and before you know it, you know everybody’s name at the bar, where they live, and what their favorite beer style is. 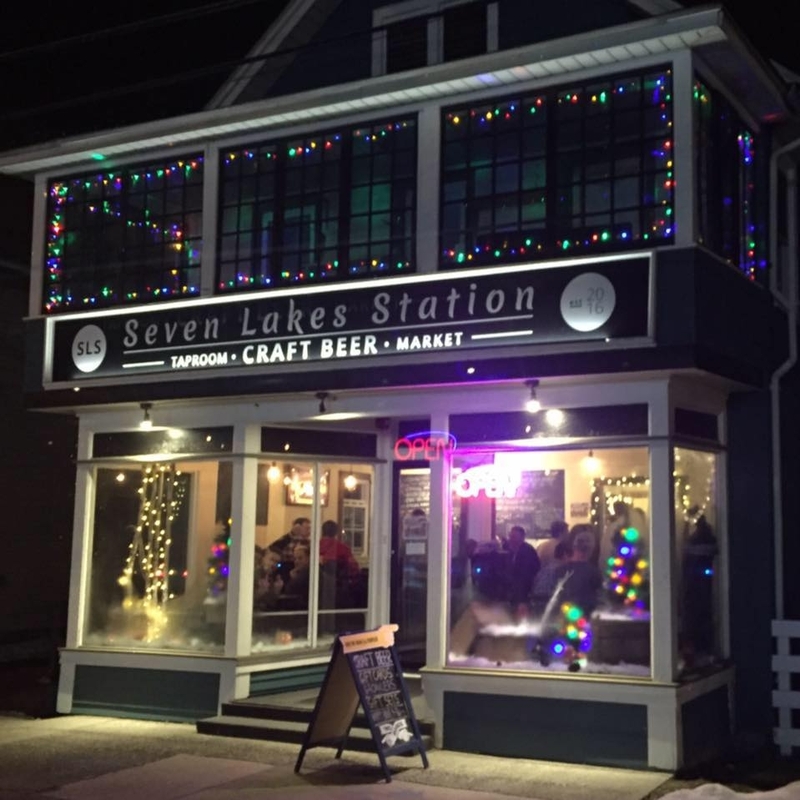 In fact, the culture of Seven Lakes Station is so mellow and so inclusive that you shouldn’t be surprised if a regular walks in while you’re there, pops open a can or two of a latest specialty offering, and shares samples with you and everyone else at the bar. This is the beauty that Martijn and his partner Jamie Lovelace have quickly and effortlessly built along Sloatsburg’s main business thoroughfare. The tap list, which constantly rotates. The pub’s 14-beer rotation of tap offerings are divided into two main categories – a collection of local craft beers, and a set of specialty brews, the latter of which most often features 2 or 3 Belgian beers, as perhaps a tribute to Martijn’s place of birth. All the beer on their board is available for growler fills, but besides just that, a walk down the hall toward the rest room reveals several coolers with a vast collection of specialty cans and bottles, all available for takeout as one-offs, or as a build-your-own six pack. On Friday and Saturday evenings, you’ll often be treated to live music from local musicians as you quaff your beer, with musical styles that run the gamut from blues to folk to reggae. 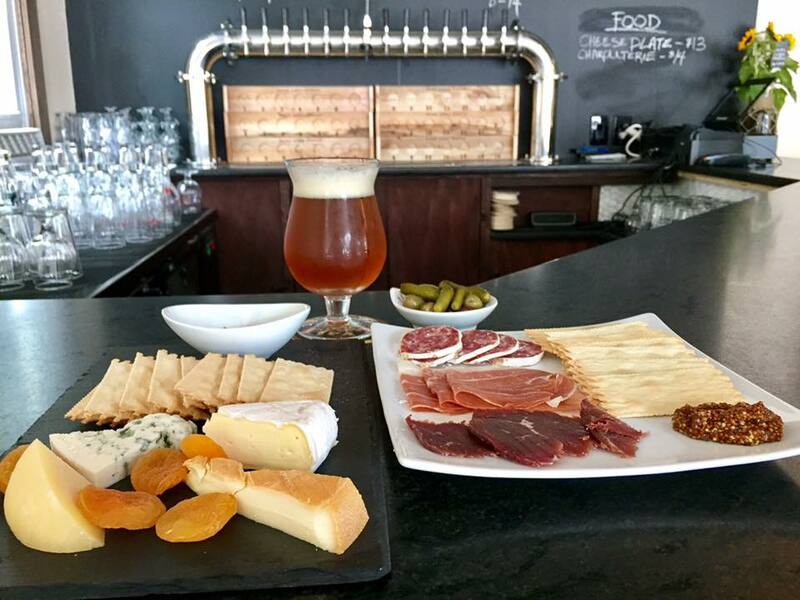 And in addition to the beer and music, if you’re feeling a little peckish, they’ve got a small but tasty collection of foodstuffs available (including pretzels, cheese and charcuterie) that will really hit the spot and set up the palate nicely for your next pour. Always smiling and positive, Martijn and Jamie create a special and memorable experience for customers, taking the time to get to know you, and fostering a sense of family among the regulars and non-regulars alike. It’s not hard to see that SLS will be around for a long time to come, doing its part in promoting all the amazing things that are going on out there in craft beer land. Drop in on them the next time you get a chance. And if you haven’t been there before, tell them the Beer Snob sent you. The Beer Snob, celebrating Christmas “La Chouffe-style” with SLS patrons. It’s not that the opening of a new brewery is a rare event these days. If you follow the beer scene, you’re aware that breweries have been popping up like Spring bulbs all over the country, and the Hudson Valley is no exception. But as common an event (relatively speaking) as it’s become, it is always exciting when a new establishment opens, and you have the privilege to be among the first beer lovers to pass through the doors of a top-rate brewing operation. 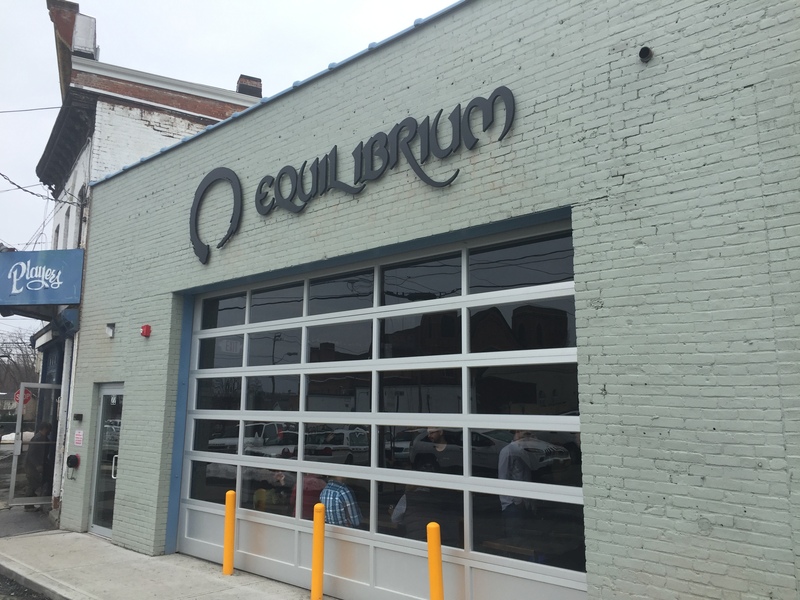 After months of chatter and anticipation, Equilibrium Brewery opened its grille and taproom to the public at 11:30am today, setting the table for what many believe will be a long and successful relationship with the local and regional beer community. 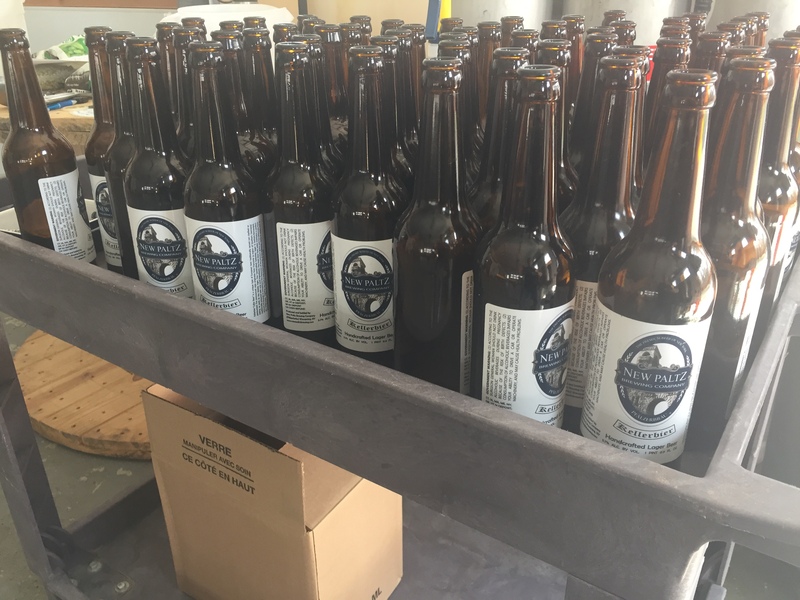 The brewery has actually been in operation since late 2016, kegging and distributing many of its products to local retail accounts, so the buzz has been building – and sounding louder and louder, in fact – leading up to today’s soft opening. But judging by the public turnout today, “soft” is perhaps the last word I might have used the describe it. 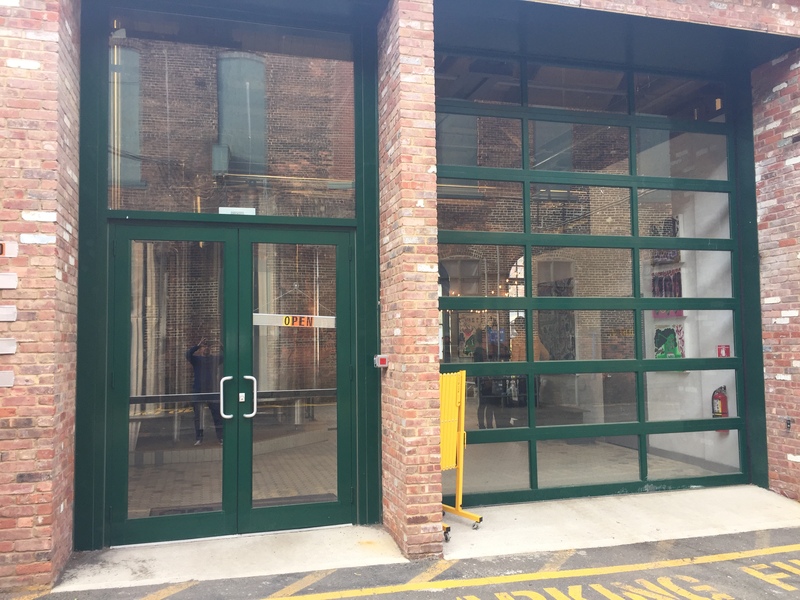 As you arrive via the brewery’s main public doorway, you’re presented with the option of going either straight up a set of stairs to the Equilibrium Grille (where there is still plenty of beer in addition to food), or a turn to the right where you’ll enter their industrial, yet airy taproom. Most patrons today appeared to have chosen to visit the grille, where many found booths from which they could order food and nosh while they enjoyed the beer offerings, and which afforded a terrific loft view of the taproom down below. 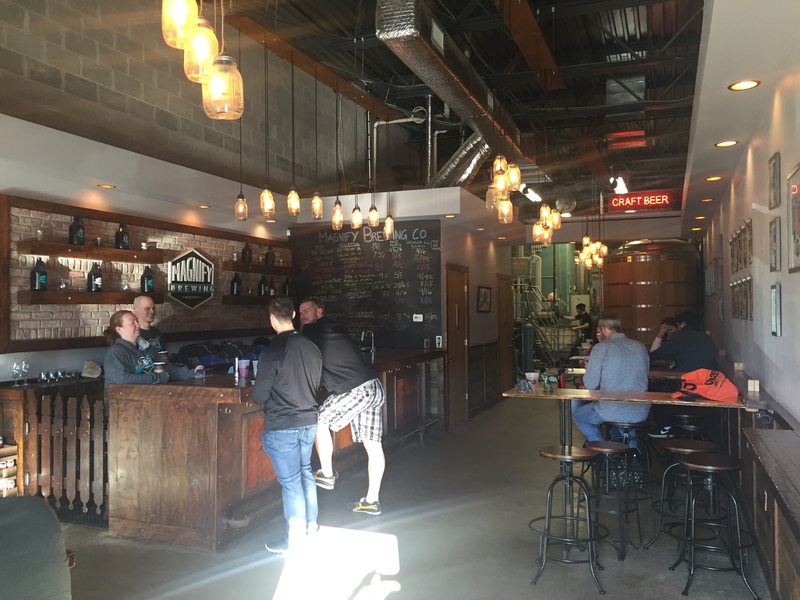 For my part, I was there alone, so chose the taproom, where I found two lines – one for people looking to fill a growler, and the other for those wishing to taste samples and order one of the six varieties that were on tap. 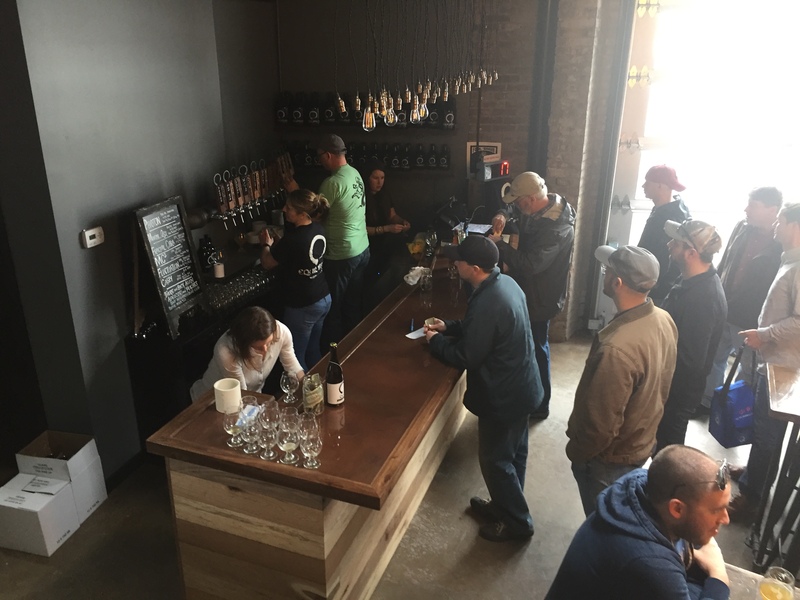 Although there was a brief issue with the brewery’s POS system, causing temporary delays with the taproom’s lines, the patrons were patient, and essentially just happy to be part of this excitement. 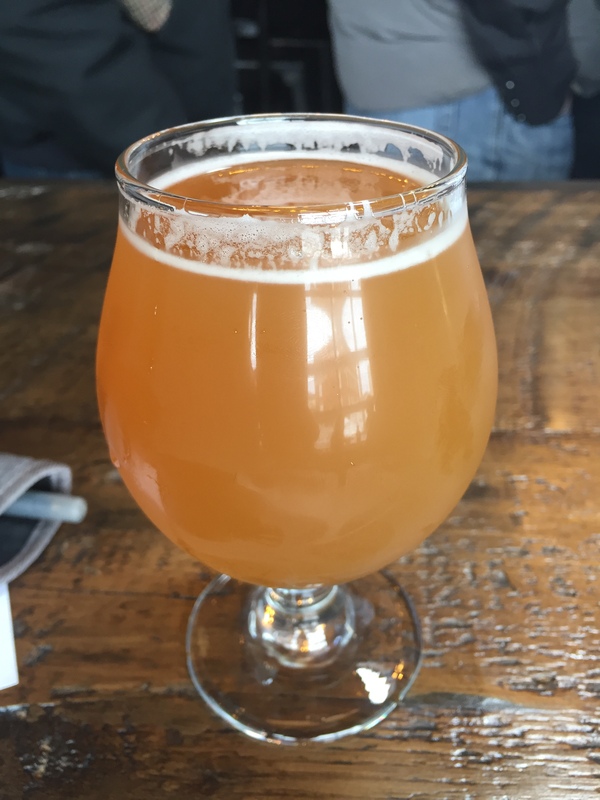 Although I held no real intention of ordering a full glass of it, my curiosity led me to sample the Mmm…Osa, a fairly low gravity pale ale, which I found to have a good mouthfeel and a tangy finish. I suspect that as the weather warms and the taproom opens its large garage door, this beer will be among Equilibrium’s most popular. But for my first glass, I decided to go with the MC², an Imperial IPA (or what some might call a Double IPA), coming in at 8% ABV. Served in a broad Belgian-style glass, this beer hit the spot for me. The Equilibrium website explains their commitment to creating beers with “massive flavor”, and this one is definitely powerful in that sense. So much so, in fact, that you don’t realize how much alcohol is in it. It’s flavor profile is direct and gets right to business, and I’m sure this one will also be a hit, not only during the summer months, but year-round as well. After slooooooowwwly downing the MC², I got back in line, and this time went with their standard pale ale, called Photon. At 4.8%, this beer is extremely drinkable, and is what the brewery refers to as MC²’s “little brother”. Also full of flavor and color, just like its big brother, Photon should be a staple for Equilibrium fans for a long time to come. 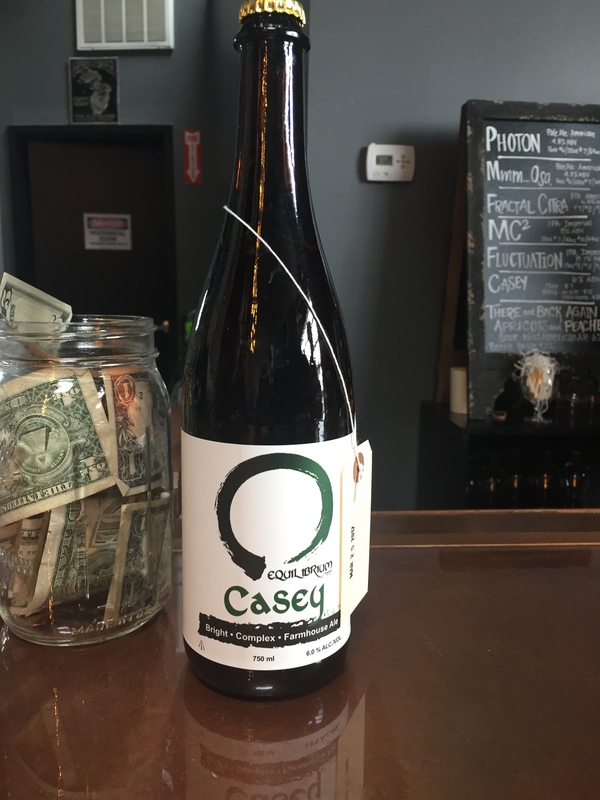 As I enjoyed my glass of Photon, I had a brief conversation with head brewer Pete Oates, who although very busy greeting other patrons, took a few minutes to explain to me the concepts that are at the core of Equilibrium’s business and operations – science, research, and experimentation. As is evidenced by the names of a number of their beers – Fractal Citra, Photon, MC² and Fluctuation – science is clearly at the root of who they are and what they do. Pete also explained to me that all of Equilibrium’s beers are “completely unfiltered”, which he says allows the full flavor of each beer to come through. When you get a chance, come on out and enjoy the offerings of this superb brewery, located right in the heart of Orange County. I, for one, will definitely be back again soon. 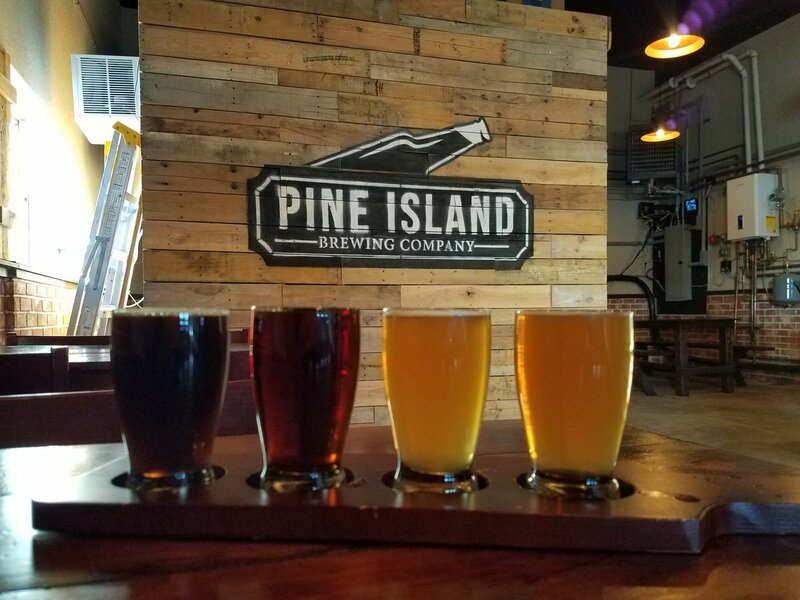 With the skies sunny and blue, and lots of white stuff on the ground from this past week’s 2-foot snowfall, today seemed the perfect day to take a drive through the area’s famous Black Dirt region and drop in on our friends at Pine Island Brewing in Pine Island, NY. It had been nearly 9 months since my last visit, which was just after the brewery’s Spring 2016 opening of its beer patio and garden in the back of the property. 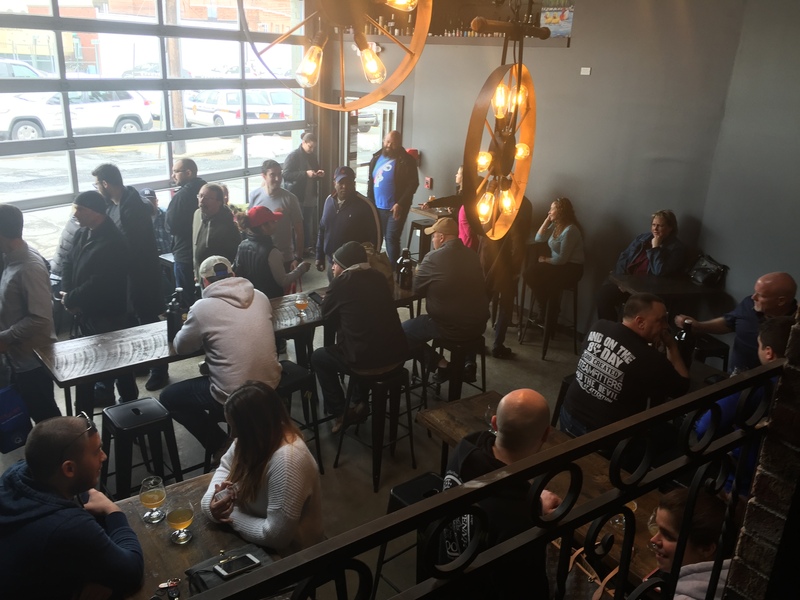 But the tap room was clearly still in “winter mode” on today’s visit, with the front garage doors closed, and the interior space made roomier to accommodate the indoor season’s crowd. Upon getting seated at the bar and taking stock of things, I noticed a couple of friends of mine in the back area near the dart board, and after dropping $25 on the bar to buy myself some beer tokens, I shuffled over to say a quick “hello”. Turns out my friends Larry and Karen, who live just down the road in Florida, were pub crawling today with another couple. As Larry told me, their next stop would be probably be Glenmere, and then they’d try to get to Rushing Duck in Chester before the 4:00pm “last call”. 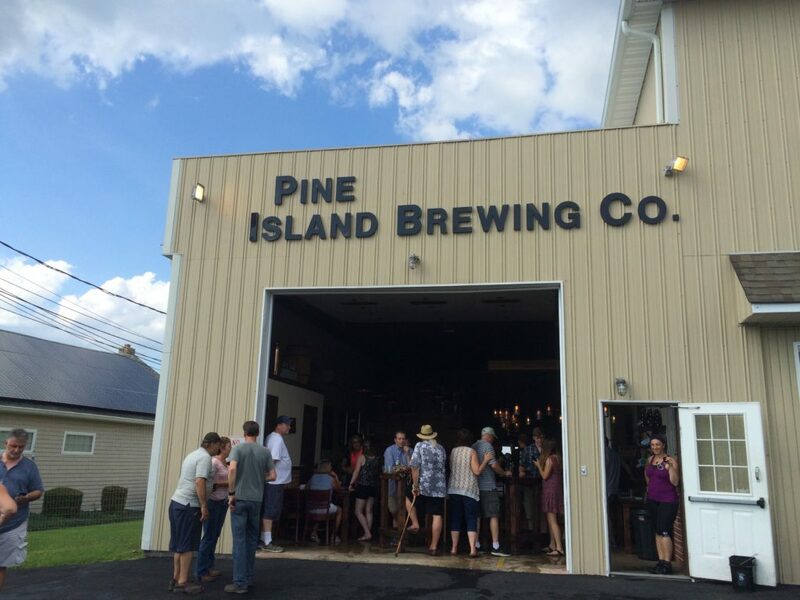 Upon sitting back down, I started off with one of Pine Island’s staple offerings, their Oatmeal Creme Stout. 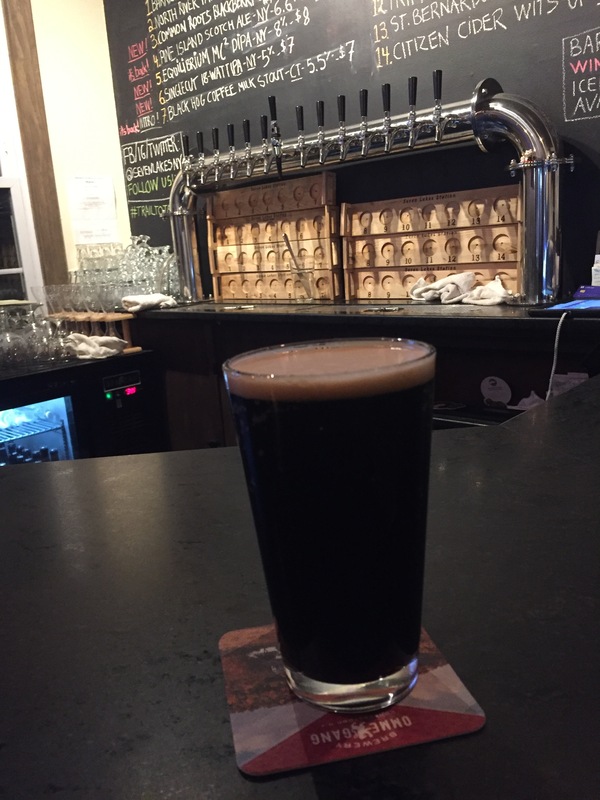 This beer is not dominated by the higher alcohol content you’ll find in an Imperial stout, so goes down smoothly, and has a soft, creamy finish. At 5% ABV, I wouldn’t exactly classify it as a session beer, but it’s about as “sessionable” as beer is going to get from a Hudson Valley craft brewery. 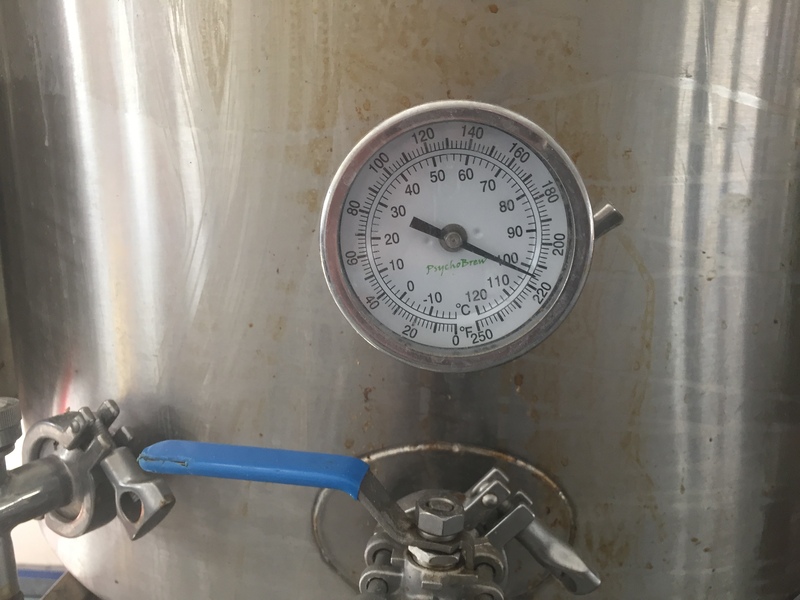 After finishing the stout, I took a look at the chalk board, and noted something that appeared new, and was perhaps one of head brewer Mike Kraai’s specialty offerings – a Belgian style IPA called Bier de Melon. Wondering how “melony” the flavor was before ordering a whole glass, I asked tap room manager Cody Lynch for a sample first. Knowing my general aversion to fruity beer, I expected to turn this one down after having the sample, but to my surprise, the melon essence was not overwhelming to the tongue. Although this beer comes in at 7.1%, the alcohol is well-hidden within its appealing flavor profile. Inquiring with him about how Bier de Melon is made, Cody explained that there is actually no fruit in the beer at all, and that the fruit essence comes from a special German hop called Huell Melon. A German hop in a Belgian ale – imagine that. It is innovative to say the least, and leaves the tongue with a lasting satisfaction. To end my afternoon session at Pine Island, I ordered their Scottish Ale, which is about 6.5% ABV, a beautiful dark amber in color, and nicely true-to-style for anyone who fancies themselves a fan of this category.